INTI International University & Colleges aims to create an entrepreneurial ecosystem as a means to transform the learning experience. Inspired by the INTI EPIC Champions Program, the Technopreneur Club of INTI International College Subang hosted “The Entrepreneurship Sharing Programme” on April 13, 2015 with the close support of Employer Relations Department. The objective of the programme was “to create a student-led entrepreneurial platform within INTI that would stimulate and encourage entrepreneurial initiatives”. 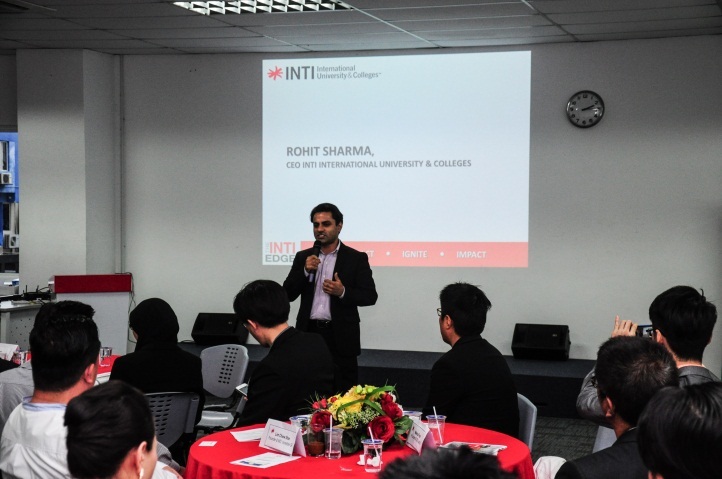 “Success is equated by today’s generation to being happy as individuals and self-starters as well as having the ability to turn hobbies into careers At INTI we help students achieve their aspirations,” outlined Rohit Sharma in his welcome speech. He advocated the idea of learning from today’s entrepreneurial icons and INTI alumni, and stimulating aspiringentrepreneurs to be ready for evolving market trends. “This platform helps both parties connect and inspire students to create an entrepreneurial ecosystem at INTI. They will be the epitome of tomorrow’s entrepreneurs in local and global markets,” stated Mr. Sharma. The programme highlighted “experience sharing” by INTI alumni and technopreneurs whose stories could inspire students in entrepreneurship. Evanna Phoon, founder and CEO of FounderMethod shared her journey in turning her dream of “Making Business Easy” into reality. Her message to “follow your dreams” was embraced by the participants and students. Marcus Teoh, founder and CEO of LukOnU shared his belief in “happiness, trust, expertise and networking” which have led to his business growth and glory. He laid emphasis on business values which define prospects for success. Michael Teoh Su Lim, founder and CEO of Thriving Talent believed youths lack opportunities, not initiatives. He applauded INTI’s approach to provide every possible opportunity to its students by showcasing their talent and helping them connect with companieslooking for youths with ideas. Lim Chiew Shan (founder and MD of Incredible QD)’s entrepreneurship strategy offocusing on solutions in lieu of problems helps students cope with crisis in new business ventures. Melvin Lim, co-founder of Cubinet Interactive develops relationships with partners with courtesy and humility. Willy Tan, CEO of Cell Gen, advocated innovation to keep Gen Y and Z motivated in businesses. According to Willy, the technological inclination of today’s youth can help companies deliver more efficiently. Jothy Govindan, International Program Manager of Wadhwani Foundation introduced the foundation and this was followed by a video presentation by Dr. Romesh Wadhwani, the founder. According to Dr. Romesh, Wadhwani Foundation is committed to creating large-scale jobs and helping to develop the skills of beneficiaries. The experience sharing concluded with the announcement that INTI International University & Colleges is the first educational institution in Malaysia to create a strategic partnership with Wahdwani Foundation. The partnership will address entrepreneurship education and training needs, incorporating skills-based education in the curriculum and helping to create an entrepreneurial ecosystem at INTI. Yong Win Sheng, President of INTI Technopreneur Club presented on the club’s experience in the Epic Champions Program, designing the Speluncking Drone which can maneuver in hard to reach places to scan and create 3D models of artifacts, and the Technology Expo on 17 – 19 June 2015. Austin Wong, one of only four Malaysian students who participated in ASES Summit 2014 at Stanford University, USA shared his success in UniSTAY.co app. Yet another bright member of the club, Nur Azre Bin Abdul Aziz, Director of NURAZ ASC Premium Gifts, NTECH Technologies and Business Consultant for AYV Electronics, shared how she turned her childhood passion for electronics into a real business. Jess Tinawin, Senior Director of INTI’s Employer Relations applauded the experience sharing by guest speakers and thanked INTI’s industry partners including Dato Peter Velappan, the former secretary of AFC (Asia Football Confederation); KC See, founder and MD of MasteryAsia & Founder of Institute of Entrepreneurship; Nurul Huda Mohd. Afandi, National Secretary of JCI Junior Chamber International; Dephy Oon, Virtual Entrepreneur and founder of Paddee Connexions; Yathavan Nadarajan, CEO of Ommtech Solutions and Social Media Strategist; Lee Sik Weng, MD of Advanced City Training Centre Sdn Bhd (ACCA); Syireen Rose, Business PR Expert at Peaches & Pen Consulting/Business Service; Wendy Lee, founder of Chapter One Asia, Corporate Image Consulting; Jan Bartscht, MD, Leadapreneur; and Robert Chaen, CEO-Founder, ChangeU. The programme provided an opportunity for students to showcase their projects, to seek assistance and guidance, and connect with entrepreneurs. It also enhancedindustry partners’ understanding of the changing attitudes of youths towards entrepreneurship and created opportunities for collaboration to develop an entrepreneurial ecosystem at INTI.